Vivaldi - Four Seasons / Piazzolla - Four Seasons of Buenos Aires - 2009 [SACD] | Free eBooks Download - EBOOKEE! Posted on 2014-06-13, updated at 2016-05-28, by supnatural. Who would have thought that Vivaldi and Piazzolla would go together? It turns out to be a stroke of genius. Combined with Lara St. John's wonderful violin, the Simon Bolivar Youth Orchestra under the direction of Eduardo Marturet seems equally at home with the Baroque composition of Vivaldi's Four Seasons and Piazzolla's Jazz-Infused Tango compositions. A very special album! Drawing from two sides of the musical spectrum - Tango and Baroque - comes Lara St. John's newest recording, featuring the Simon Bolivar Youth Orchestra of Venezuela and Eduardo Marturet. The disc features Vivaldi's seminal work, the Four Seasons, which is the top-selling classical work of all time, paired with The Four Seasons of Buenos Aires, Astor Piazzola's tribute to Vivaldi. There is tremendous interest in this orchestra, and this is the first time it has recorded with the Ancalagon label following successful recordings with the Deutsche Grammophon label. 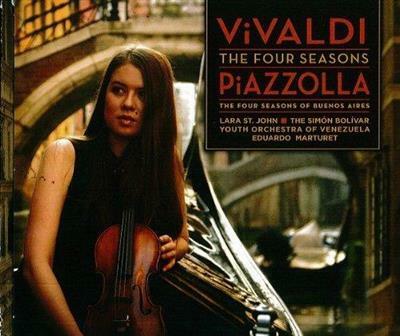 No comments for "Vivaldi - Four Seasons / Piazzolla - Four Seasons of Buenos Aires - 2009 [SACD]".